In a new multi-unit project, Argentinian architects Estudio Galera have employed local craftsmen to build using local bricks in a rural setting 240 miles south of Buenos Aires. Rincon House is the first of a series of rental houses near the beaches of Ostende, a town that was once a coastal jewel and is undergoing a slow revival. Ostende is part of Pinamar County, an area predominately attached to the coast. The town gradually lost its status as a holiday destination when neighbouring cities of Pinamar, Valeria del Mar and Cariló started to divert tourists to their attractions and holiday housing markets. Subsequently, Ostende's vacation properties have been occupied by permanent residents, mainly from working classes. Placed on a 620m² plot of land, the 115m² Rincon House was completed from June 2017 to June 2018, with labour working full-time Monday to Friday, and half days on Saturdays. Construction is forbidden in the high summer months of January and February, meaning the total project was completed in nearly 230 days of work. Five full-time manual labourers were worked, predominately focuses on the masonry and concrete structure. The focus of the preferences of local craftsmen guided the choice of common bricks as the main material in the construction. Material for concrete flooring and surfaces were supplied by local industrial specialists, Pasalto, with coarse aggregate supplied by Cermat. Other collaborators included workers for electricity, plumbing, air conditioning, landscaping, wooden millwork from El Holandés, aluminium millwork by Anaya Metalurgia, as well as four craftsmen completing custom metal working alongside Acindar Plastigas. The architecture of Rincon House and its forthcoming siblings hopes to reflect the geographical, historical and social implications of the place, while matchings the aesthetics of contemporary design. 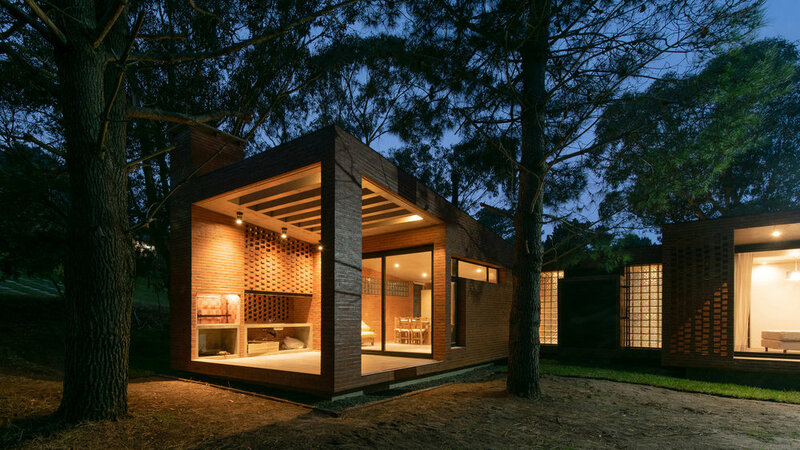 The "brick chalet" of Pinamar was popular during the 1980s and mid-1990s, characterised by a principle frame with exposed bricks, wood millwork and large sloped roofs. Rincon House updates these principles, adjusting materials according to current technology. This lot is made of a garden of mature eucalyptus trees not normally found in a sand dune topography. Themselves relics of Ostende's history as a place for leisure, the trees have been integrated with the property's orientation. Subsequent properties will be placed on adjacent lots in continuation of the architectural theme. The double slope on each side of the building opens the space to the exterior, sweeping light across interiors in the morning and afternoon. A double bearing wall made of common brick forms an air chamber and solves the thermal, waterproofing and structural needs of the structure, while reducing the need for additional insulation. For more on Estudio Galera's principles and projects, visit estudiogalera.com. Photography by Diego Medina unless stated.